Christmas obligations are met and it’s time to go camping! Our fun Christmas campers are starting to join us at Tillicum Campground! 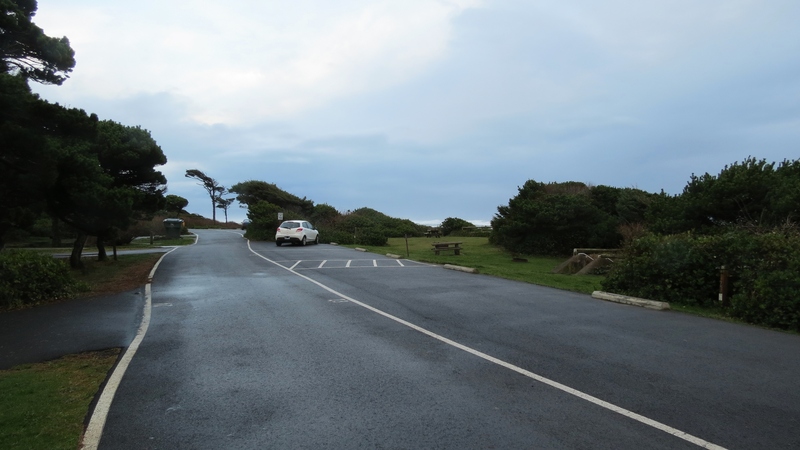 Did you know that you can use your campground receipt or car pass in any of the Day Use areas and Waysides; whether State Parks or National Forest? If your receipt is required on your site post, ask the Host for a Car Pass. We stopped in to take some photos at Governor Patterson State Park this afternoon. 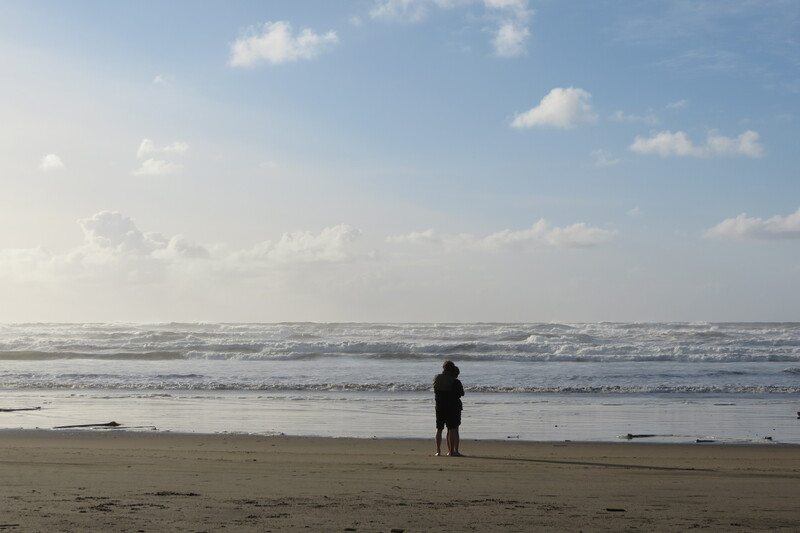 There are SO many great waysides on the Oregon coast. Some are State Parks and some are National Forest. Gov Patterson State Park has a restroom but not all of them do. They usually provide access to the beach. 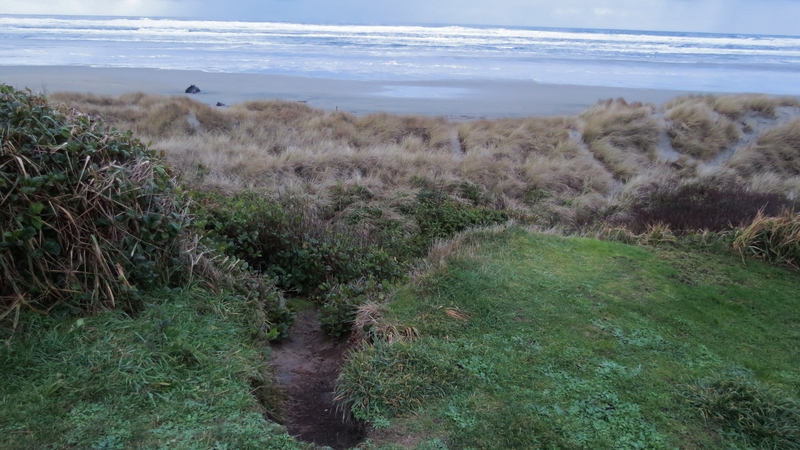 This one has several short paths over a small sand dune. Some require a fee to park if you do not display your annual pass. There’s a wide, sandy, beach for walking. Driftwood builds up after the Alsea River floods. 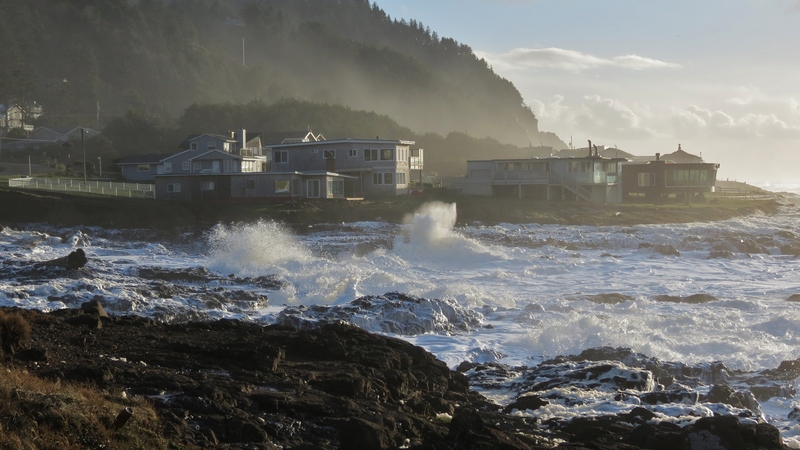 High seas can move it all away with just a couple high tides. Whether a State Park or National Forest, you can use any of the Day Use passes instead of paying the $5-$6 parking fee. Hhhmm – now there’s something worthwhile to spend that Christmas money on! I’m so glad the world didn’t end today. 🙂 I’d really miss this place! I suspect campers will start coming in on the day after Christmas. We’ve got two loops open. Did I mention that Tillicum is great for whale watching? I had time for a quick walk on the beach. I picked up some styrofoam, a piece of a metal cabinet and threw some driftwood off the stairway. 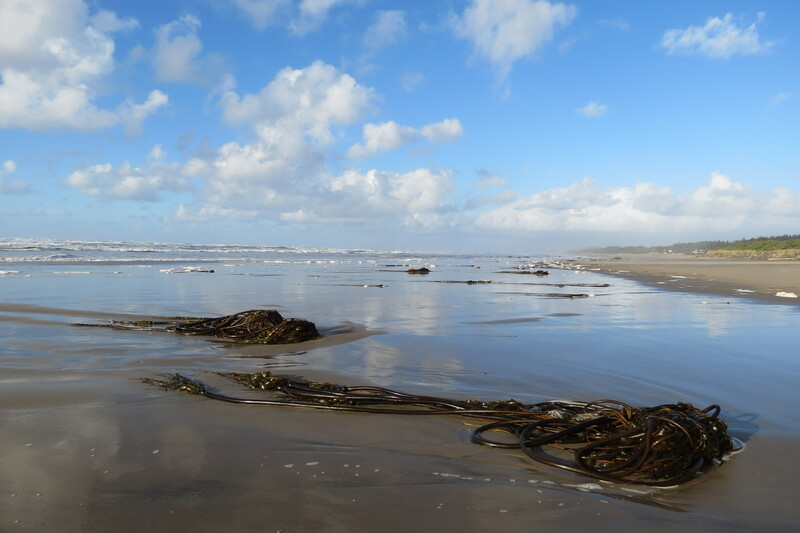 There’s a good amount of driftwood on the beach from the Alsea and Yachats rivers flooding. But it doesn’t impede a nice walk. 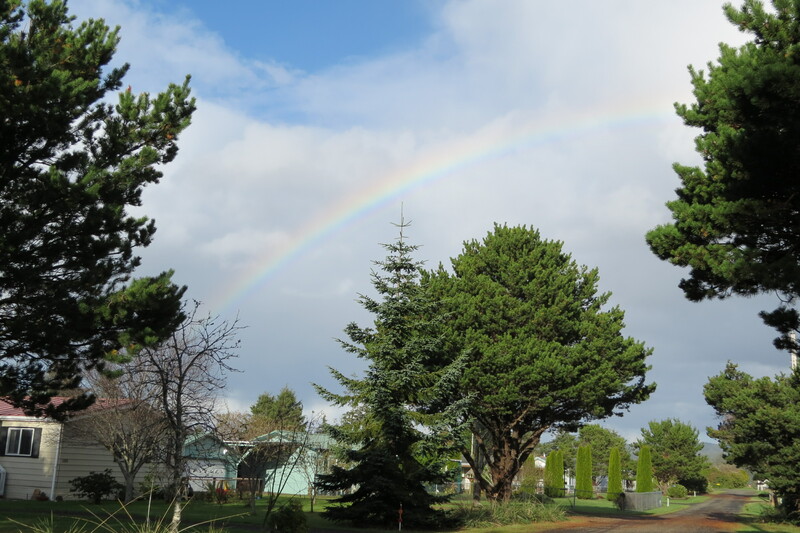 Wind, rain, hail and sunshine…all in a matter of 10 minutes. No trees down in the campgrounds. Just fun weather to watch! It was stormy all day. 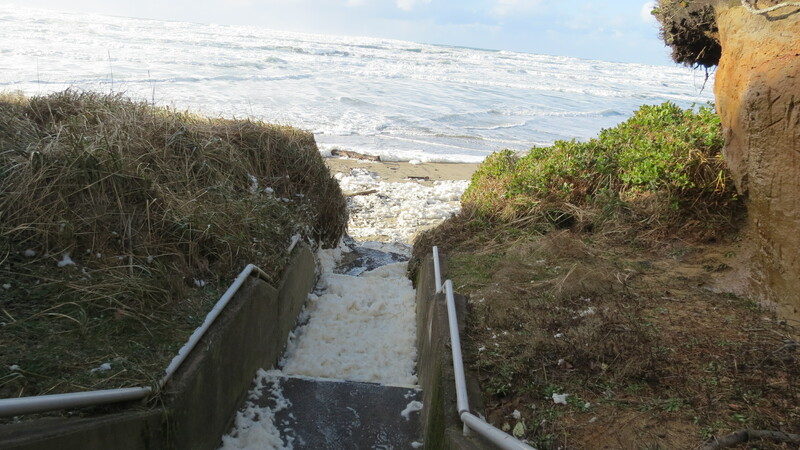 Look how far up the stairway the waves came at high tide today! 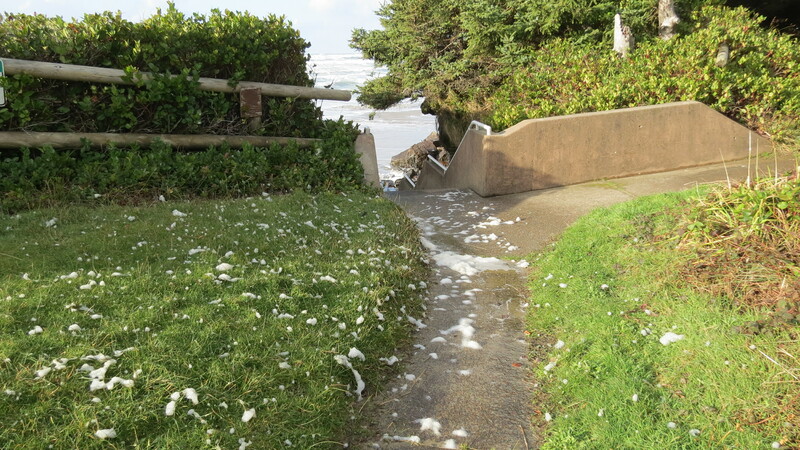 Even more unusual, the south stairway had a thick layer of foam on the bottom platform. Can you spot the float? 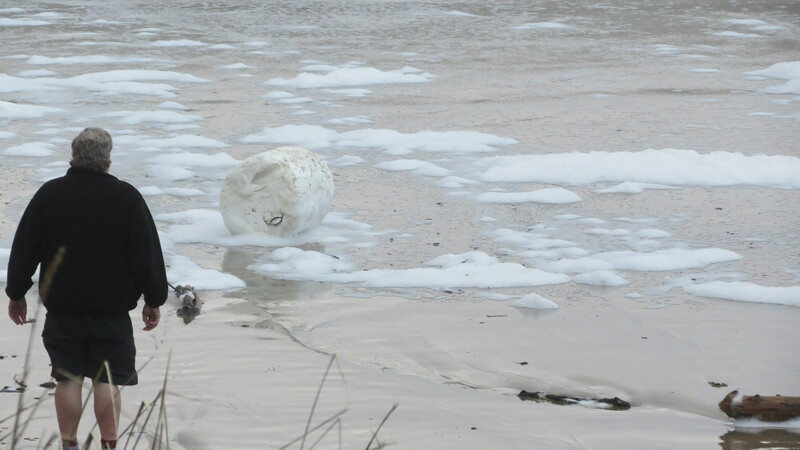 Not my favorite kind of float but it’s still a fun treasure to find. 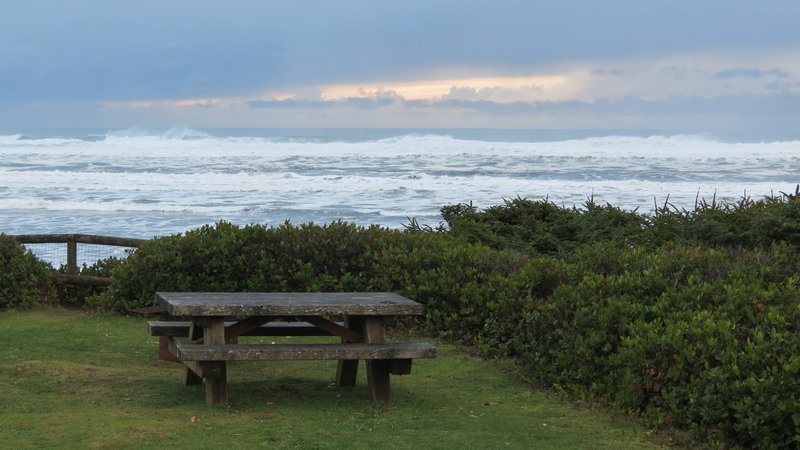 We had to stop in Yachats too. I don’t know what those smaller birds are but they were the ones chirping at the waves. 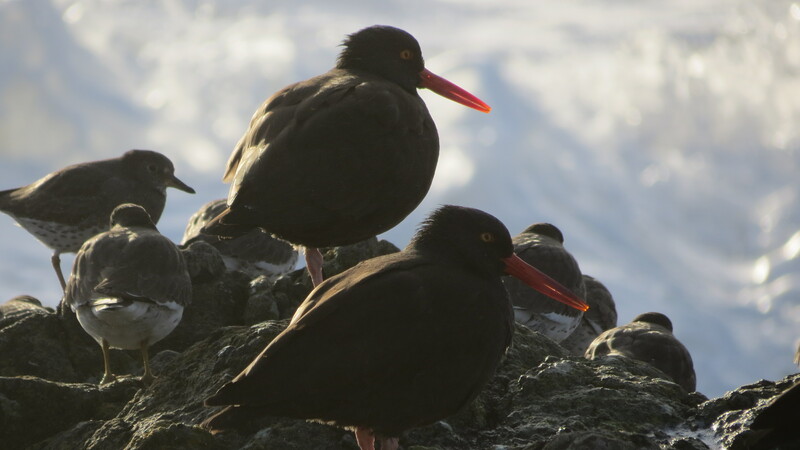 The Oyster Catchers were hunkered down on the rocks in front of the seagulls. We were in Newport (indoors) for most of the day. Crossing the Newport bridge, before noon, we noticed the waves crashing clear over the jetties! I wished we’d had time to stop to take some photos then! I would definitely use my zoom to keep a safe distance though (mom). We have minus tides and extra highs this week! 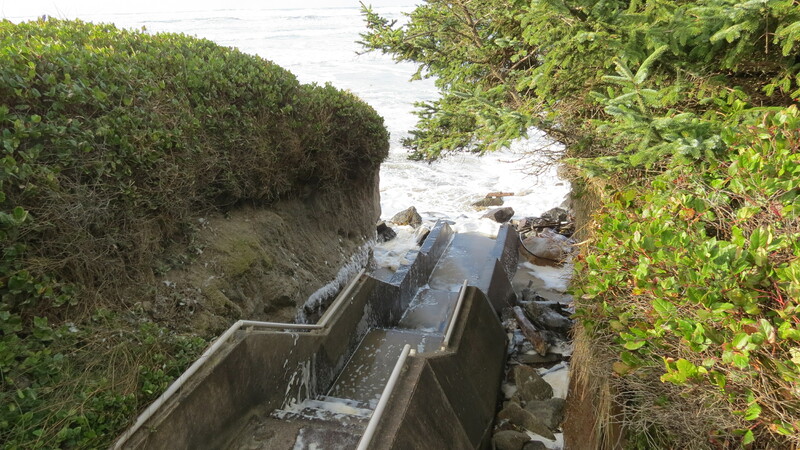 There is about a 12 foot change; which is about the most we get here on the central Oregon coast. 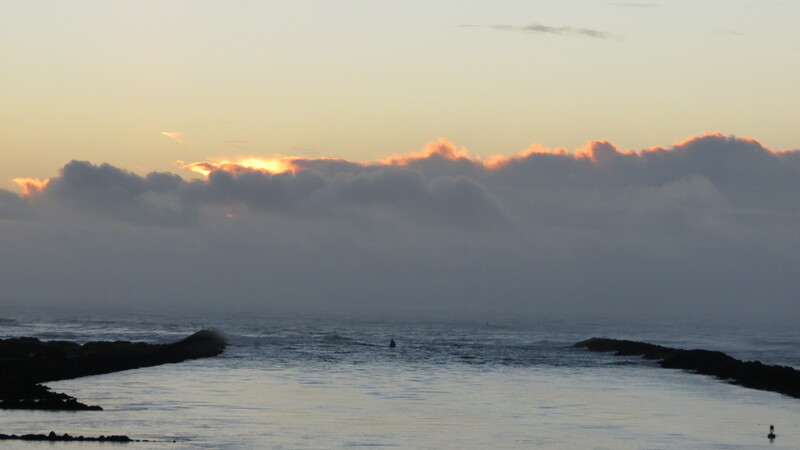 Even the low tide waves can crash over the jetties. Every year some unwise person is killed by a sneaker wave. Stick to the roads and trails on the jetties. Don’t stand out on the rocks. Sneaker waves are not as big an issue if you’ve got level sand to run away on (like at Tillicum Beach at low tide or anytime in the summer). 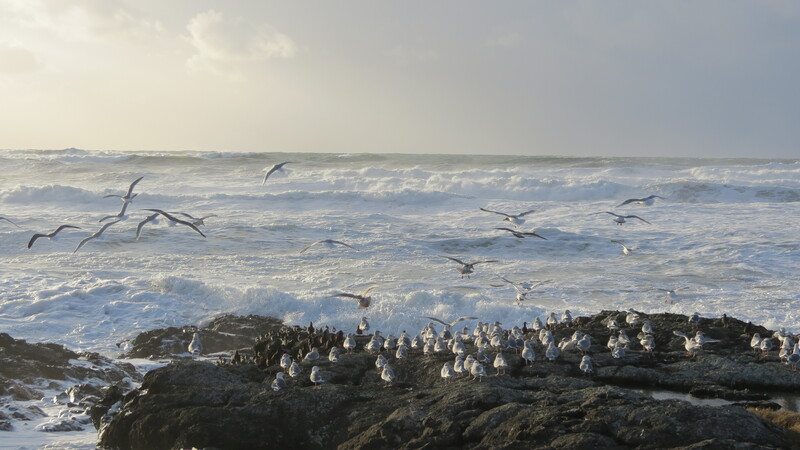 It’s the rocky areas that are dangerous (like the jetties and Tillicum Beach at high tide in the winter). 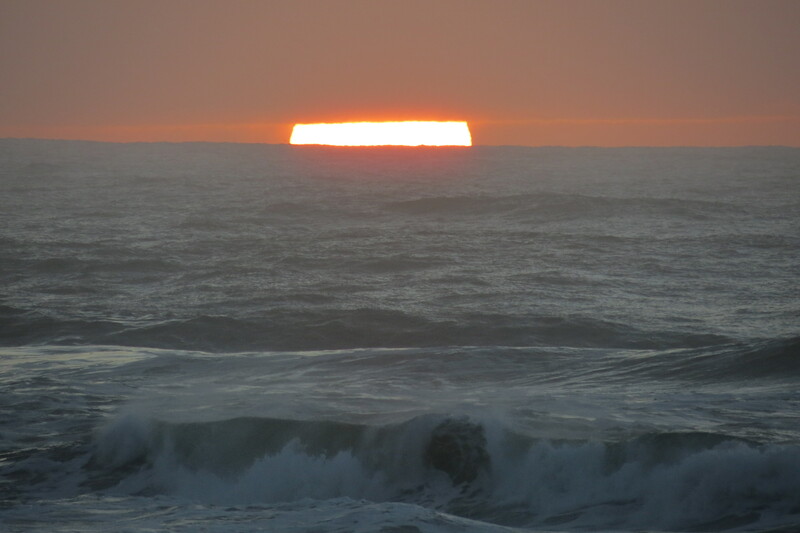 We’ve got high tides and showers through the weekend. 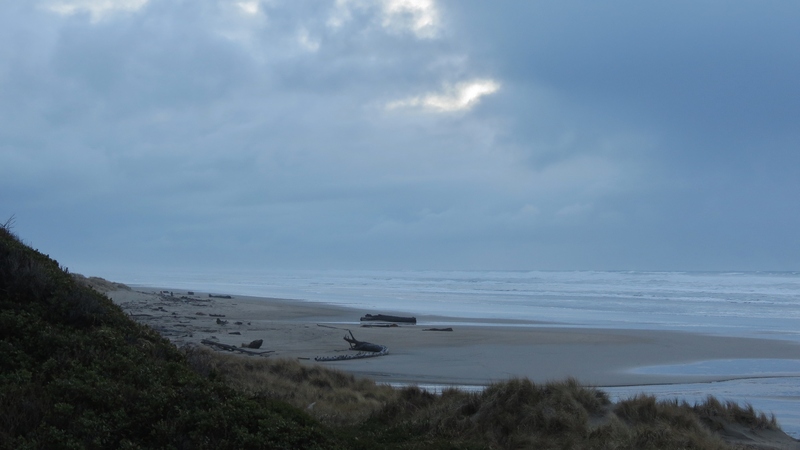 So it will be a great weekend for camping on the Oregon coast! 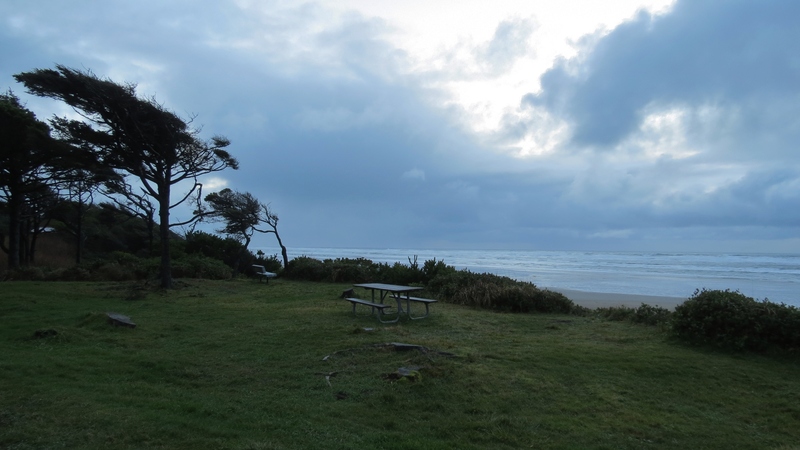 We took a jaunt up to Newport and down to Tillicum Campground today. 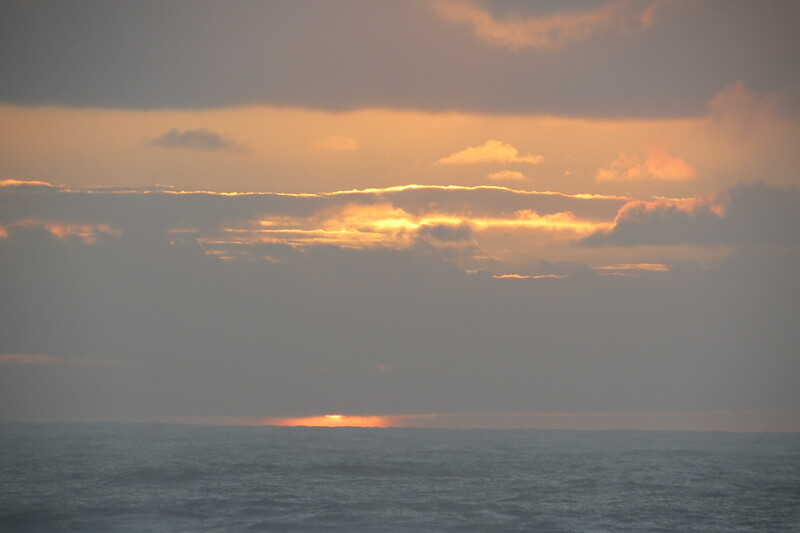 The rain subsided so it was a good day for seeing wildlife and the sunset. 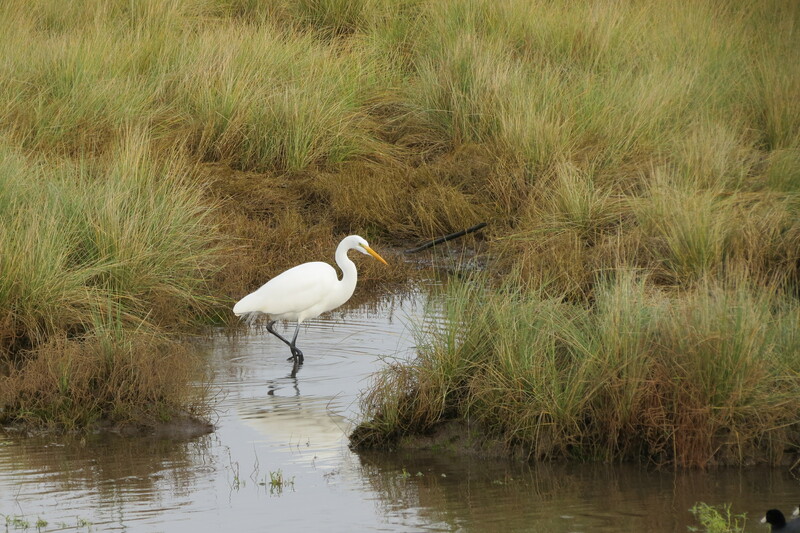 This Great Egret has been hanging out on the salty side of Eckman Lake lately. We were finally able to pull over without disturbing it so we could take some pix. We spent a couple hours volunteering in the Family Search Center in Newport. After that and a little Walmart Christmas shopping, we headed south again. 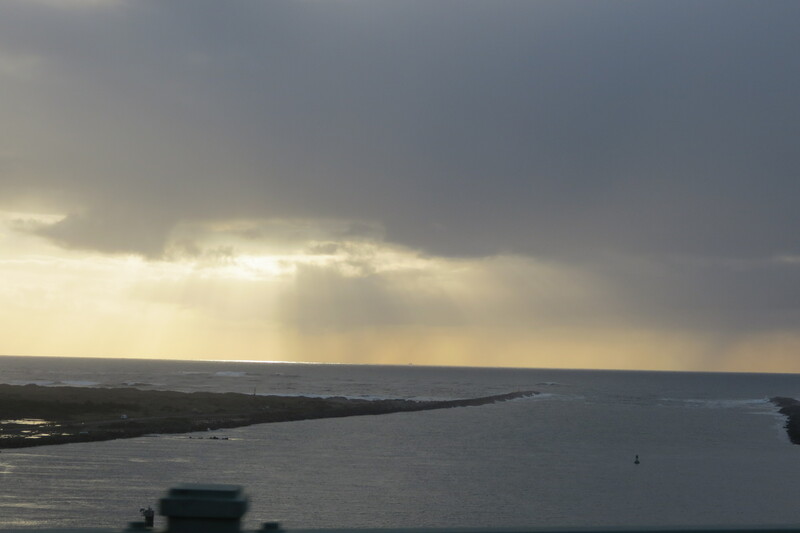 We didn’t have time to stop to enjoy the view so I snapped this photo as we crossed the bridge across Yaquina Bay. There’s a big boat out there! We had a little business at Tillicum Campground. Don could tell I was tapping my toe while the sun was getting close to setting. When I threatened to run off with my camera he decided he was ready to go too. There were only 2 campers in Tillicum tonight. For being right on Hwy 101, Tillicum is very quiet in the off-season. It has 7 electric/water sites. 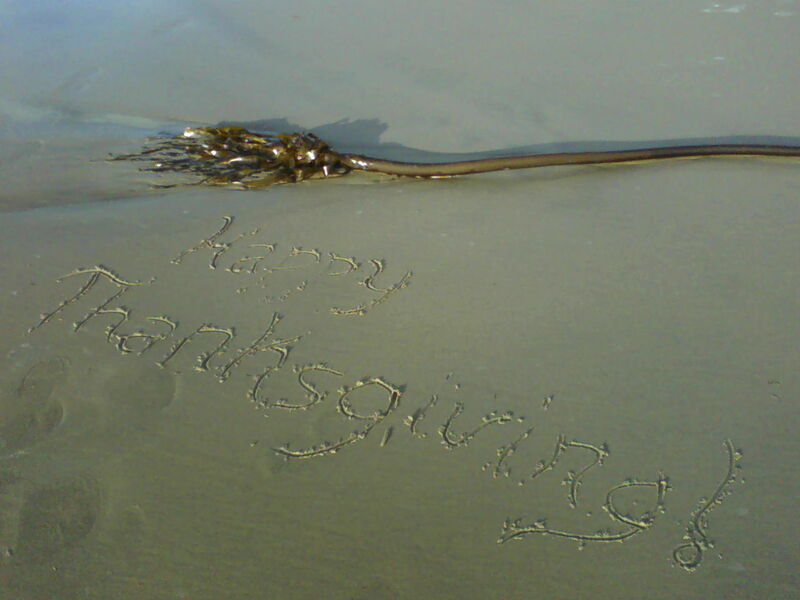 It’s going to be a beautiful Thanksgiving weekend on the Oregon Coast! So…what’s your pleasure? 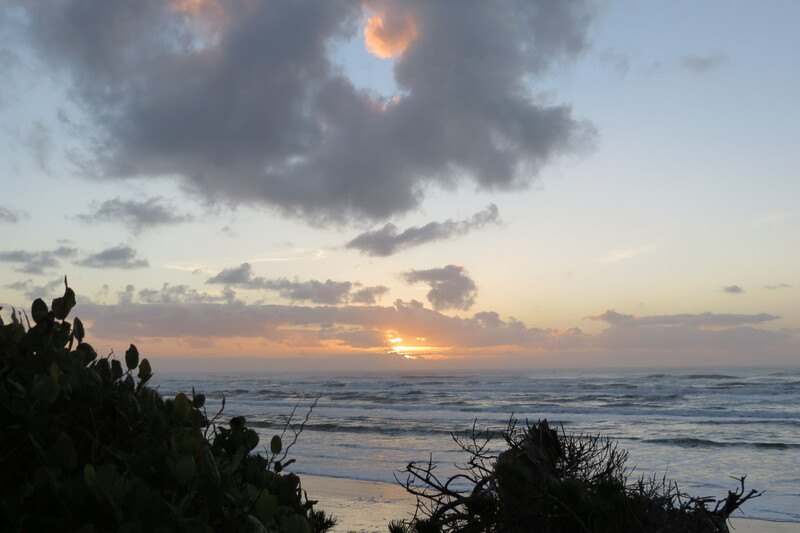 Camping overlooking a romantic beach? Or maybe camping near the dunes? Sutton Campground is perfect – and Three Rivers Casino has a great Thanksgiving buffet! The river level is dropping fast and it is clearing up. It should be good for the holiday weekend. Once the river level drops, the crabs will be back in the bay too. 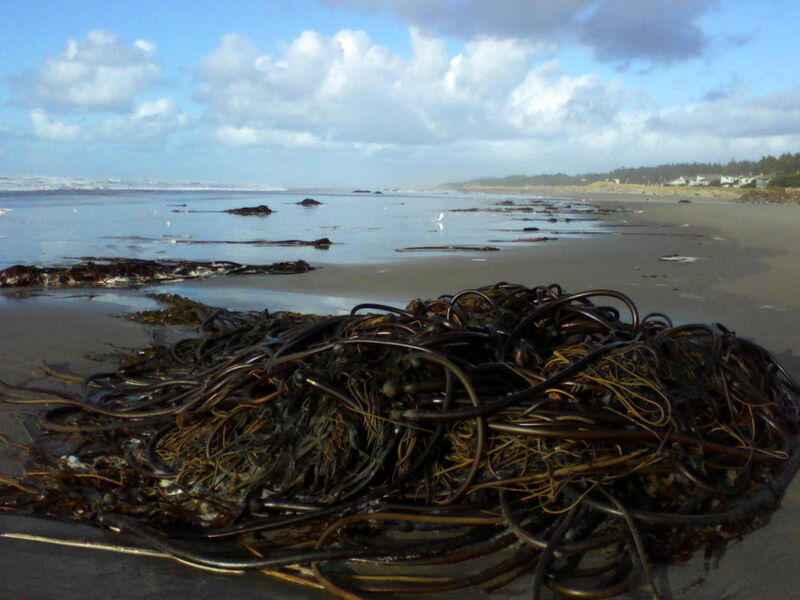 The storms sure stirred up the bull kelp. 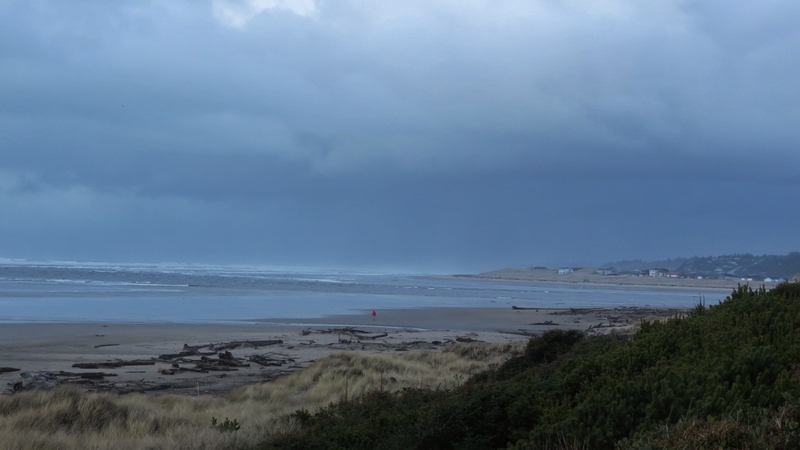 There was nothing on Tillicum Beach yesterday. But today mounds of it were all over the beach! And wherever the holiday takes you, be safe. We made a run to Florence today. Yay! To the BEACH! Travelling down the Alsea Hwy from Tidewater wasn’t a problem after the recent rain/wind storm. Hwy 20 was affected more. 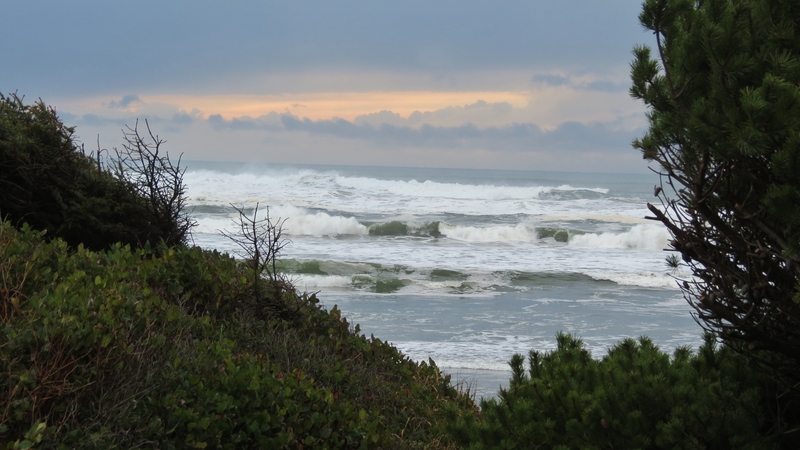 Hwy 101 from Waldport to Florence was also clear. We just had to stop in to Tillicum Campground to check out the beach. 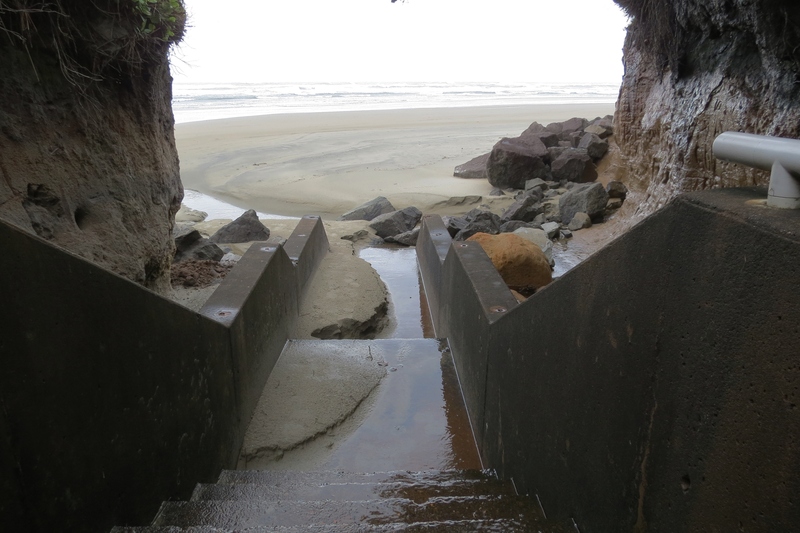 The rain is washing some of the sand off the stairway. 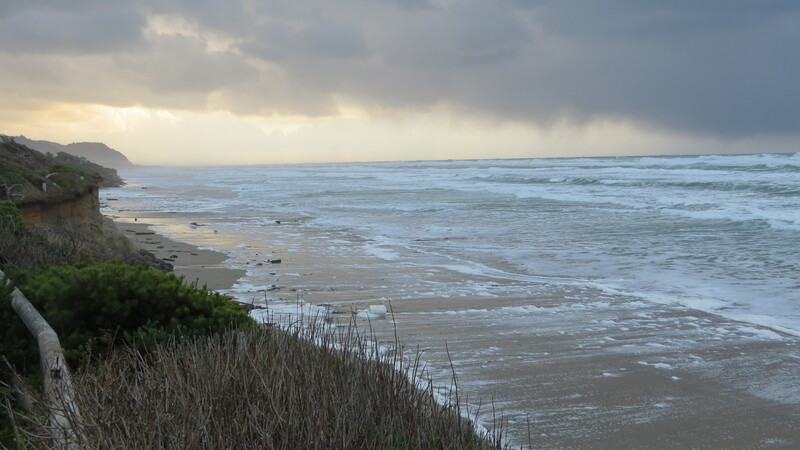 Winter storms will probably continue to was sand off the beach. Maybe we’ll see some agates this winter? We haven’t seen the lighthouse since they took the cover back off so I had to get a photo of her new coat of paint. They haven’t finished restoring the lens yet. We had thunder showers most of the day. As Don put it, “we travelled through all the seasons” today. 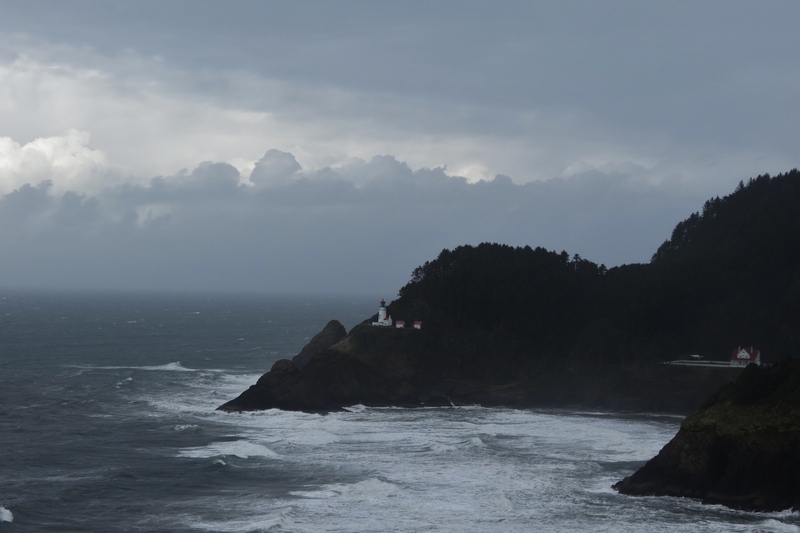 There was a car at the north end of the Heceta overlook pullout so we parked at the south end. 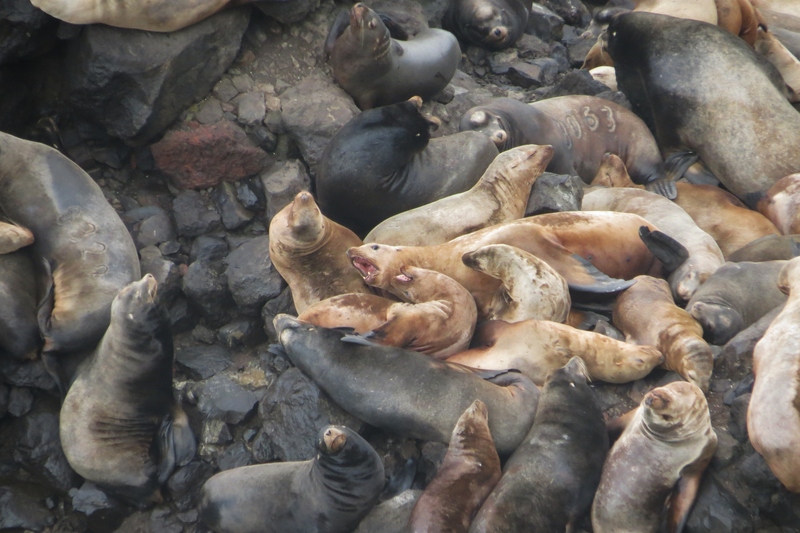 Three people were SO excited to call me over to look at all the sea lions! 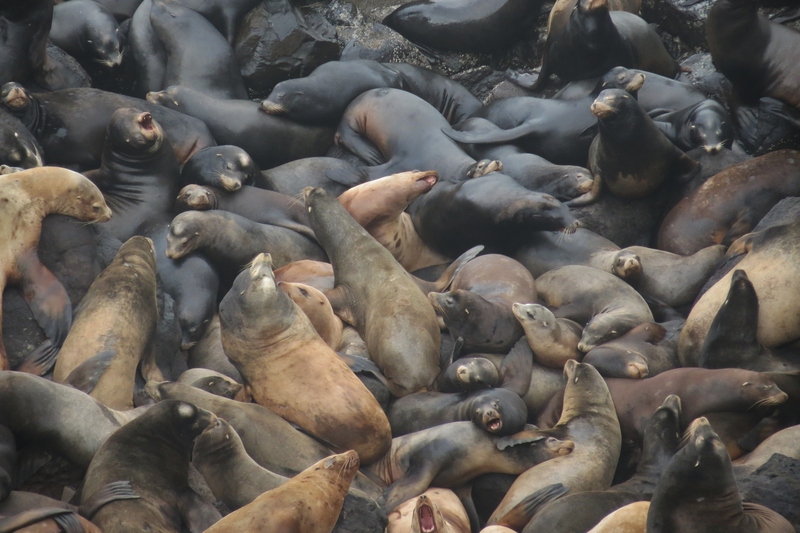 Sea Lion Mosh Pit – Can you see one rock in there? 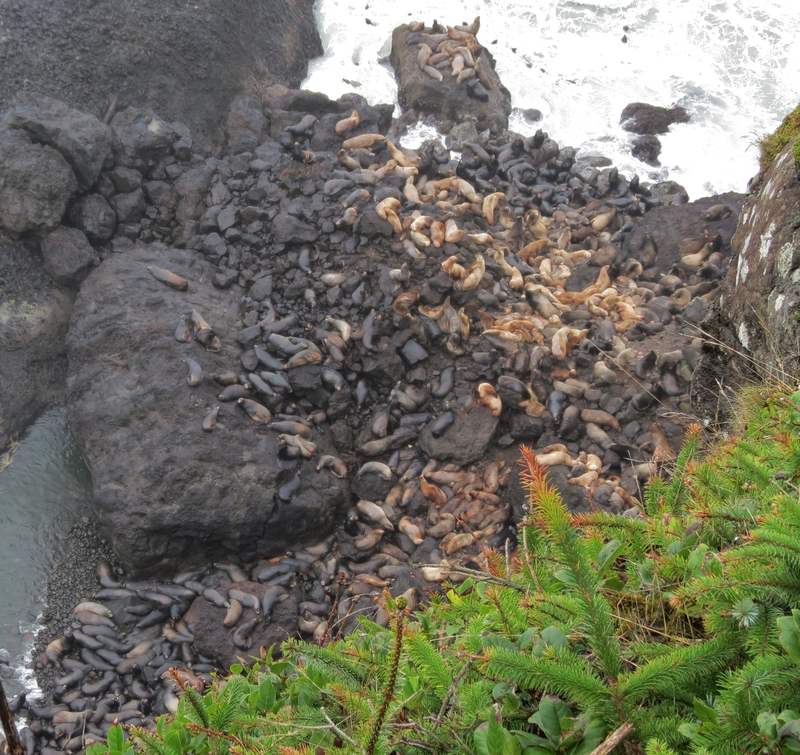 Found a couple branded sea lions too! I’ll ask my Forest Service friend about them and edit this post if he can find out anything about them. Sometimes they’ve been able to tell me where, why and when they were branded. Some are branded as pups as part of a study. Others are because they were being a “nuisance” to the salmon.